The shipping industry has been through many upheavals since the industrial revolution. Faster ships at the turn of the century meant that your goods could get to the end destination quicker and the standardization of containers in the 1960s helped usher in a more interconnected world. With that in mind, the shipping industry is also set to do it all again, and this time with Blockchain technology. Maersk and IBM have partnered to produce TradeLense, a product built on top of a custom Blockchain. In short, TradeLense allows transparent tracking of goods in the supply chain. Even down to the location of individual shipping containers within one click. Usually this process requires multiple go-betweens to get the data, increasing the time taken to get it. Not only are these methods slow, they often involve paperwork. It is estimated that the cost of trade related paperwork is between 15 and 35% of the cost of physical transportation of goods. In 2014, Maersk purposefully followed a container filled with roses and avocados from Africa to Europe. They found that over 30 organisations were involved in the processing of the goods during the entire journey. These range from port authorities, to customs on arrival. It took 34 days to get from the farm to retailers. Of those 30 days, 10 were spent waiting for documents to be processed. During that time a critical document went missing and was later found in a pile of documents in a port office. Standardization of paperwork has lagged behind other industries in this regard. Mostly due to language barriers, individual countries’ laws and private industries’ regulations in moving cargo. For an industry that shot forward in the 1960s due to an adoption of a standard practice they are “getting left behind” said a Maersk spokesperson. Blockchain technology came along at just the right time. Maersk then ran a 12 month pilot of TradeLense. 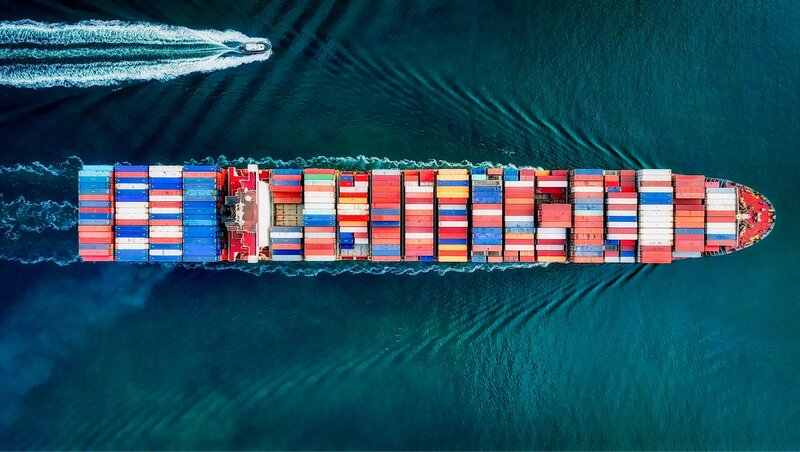 The aim of this was to see if external and internal organisations that are key to the shipping of goods could benefit from it and if the supply chain could be sped up. The results were positive: finding the cost of transportation dropped and reliability and accuracy of the data related to said goods had increased. They did not release exact figures however. Not only able to ease paperwork, Blockchain can also help verify the provenance of high value items in the supply chain. Rather than sending paperwork alongside, which could be tampered with or worse lost, Blockchain could allow the item to be verified instantly. It’s worth saying that this system isn’t fool proof. If someone was to maliciously enter data onto the Blockchain in an attempt of fraud, then the Blockchain would consider it valid. It wouldn’t know to ignore or report the fraudulent data. The flip side of this however is that data on public Blockchains is open and transparent. An open system allows for more eyes to check the validly of the data in the system, thus negating the risk of these issues. Blockchain itself is also considered very safe from hacks as each node would need to be verified on the chain as per the standard of any Blockchain. TradeLense specifically has been rolled out as a soft launch already as of summer 2018, with a full launch expected at the end of the year. If Maersk can prove the product as viable, with some arguing they already have, they will be a world leader in a marketable Blockchain powered product. Maersk is aiming for this system to be the worldwide standard, pushing for an open and transparent system where anyone can build on their platform. The system is already being used in more than 20 ports worldwide including PSA Singapore, Hong Kong, Halifax et al. As of Thursday, Oct. 25 the Canada Border Services Agency (CBSA) have announced they are investigating the platform saying they will “determine what role the platform could play in its business processes”. “TradeLens could create a singular, trusted digital supply chain for all shipments entering Canada. The TradeLens pilot gives us an opportunity to not only find process efficiencies and gain analytical insights, but improve data providence, accuracy and targeting capabilities,” CBSA president John Ossowski said. So, it is conceivable to think that in the coming years, the shipping industry could become a leader in technological innovation once again.